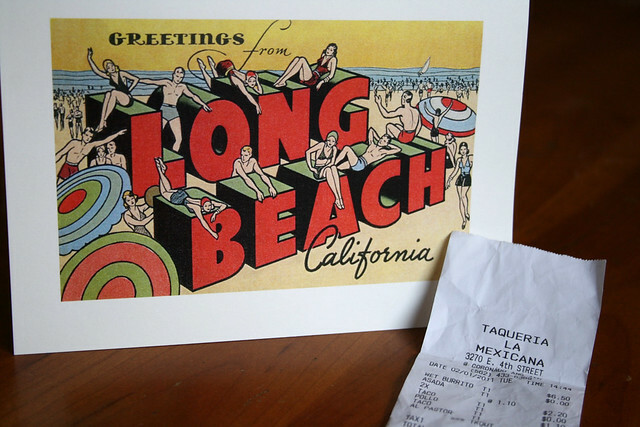 There are too many hole-in-the-wall-taco stands out there; too many excellent options for carne asada burritos or lengua tacos and my decisions were not made any easier while spending time in Long Beach. 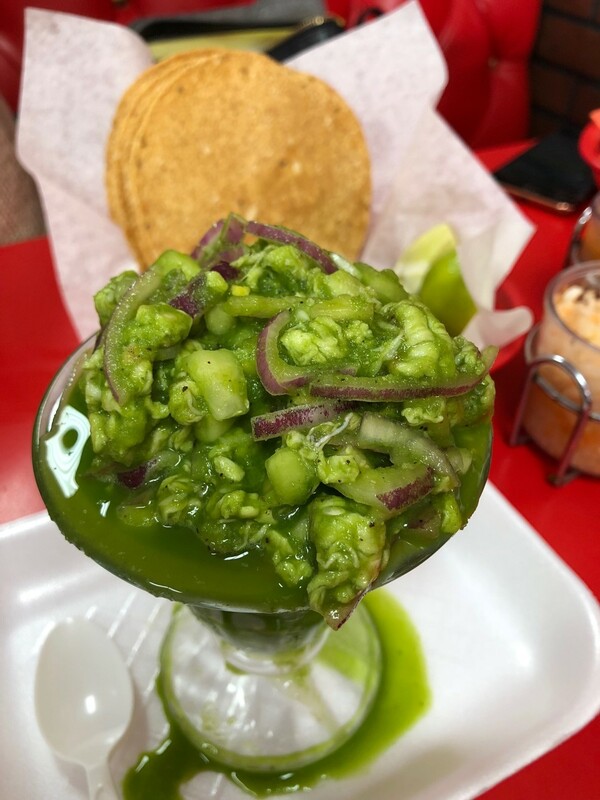 A casual search on Yelp can yield a mindboggling survey of worthwhile Mexican joints; enough to keep your stomachs puffed and britches uncomfortably tight while you search for the perfect Latin fare. Cruising the streets near downtown you might pass by a myriad of intriguing eateries. On the corner of Coronado and east 4th street I spotted a perfect spot to grab lunch—Taqueria La Mexicana. On Monday, when I happened to drive-by around lunch, about eight people were massed by the order window (a good omen), each transaction expedited and made even quicker by the cash-only exchange (typical of Taquerias). I queued up and placed an order for a wet burrito and three tacos (I was sharing the order). A little over a Hamilton ($10) later and I had a massive meal in hand and was ready to eat at my parents’ apartment. 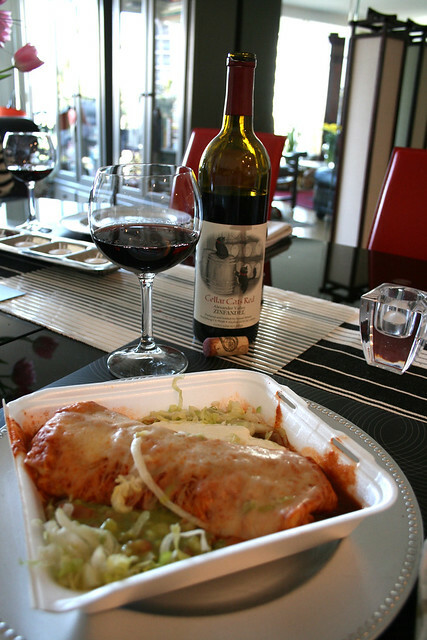 I was nervous about what wine to pair with the food—over-thinking it because wine is not always my go-to when eating tacos or burritos—and also not really aware of La Mexicana’s piquancy. I thought about the pairing potential of Zinfandel, that it might be the best match I had in my makeshift cellar, because of the body of the wine on the tongue. I thumbed through my zinfandel-heavy-roster until I came across the Cellar Cats red from Sausal winery (#448). It was billed as a lighter Zinfandel and fruitier that would still be able to hold up to hamburgers and cheeses, naturally I assumed a taco or wet burrito would be a good partner. 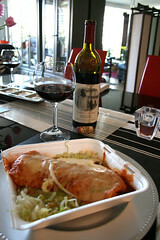 Unwrapping the foods, plating the tacos and leaving the wet burrito, as was, framed in the Styrofoam container, we ate. The burrito was enormous, dressed in enchilada sauce, guacamole, cheese and lettuce; I chose to eat it with utensils. I ate a few bites to get the feel for the street-style food and drew the chalice of Cellar Cats to my lips. 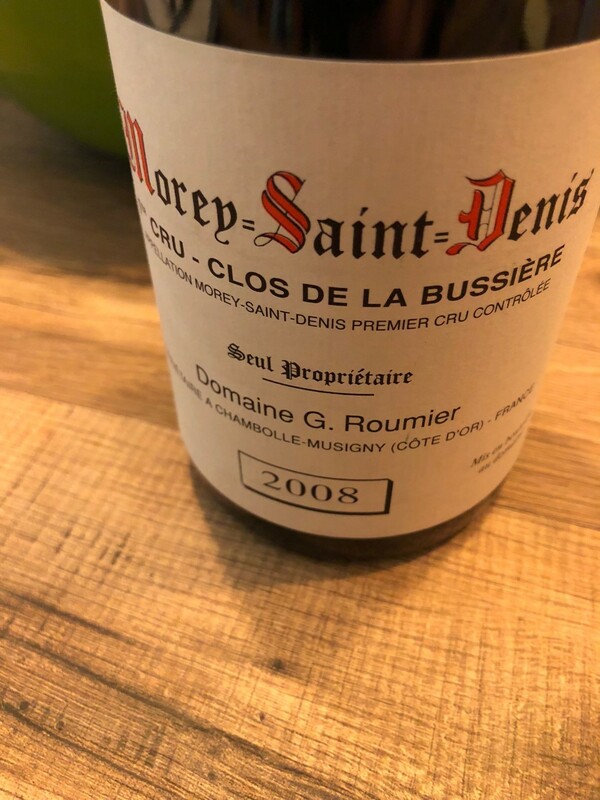 On the nose there were ripe strawberry aromas with subtle toasted wood notes, living up to it’s billing, and the palate followed the nose—fresh strawberries overpowered the wine. The Cellar Cats was delicious on its own but with the Mexican food it quickly became unhinged, the slight spike in alcohol on the palate did not dissipate but was pronounced. It was nothing I couldn’t tolerate but I was hoping for a do-wa-diddy-diddy-dum-diddy-do experience or, some fireworks a la Rodrigo y Gabriela at least. It was not what I had imagined—not a resounding success. The food exposed unflattering elements of the wine, components less detectable when sipped alone like man-hands on an attractive young lady. It was supposed to be a flawless combination on paper, and with that in mind, I would pair it with a heartier Zinfandel or even a high acid German Riesling (white wine) because the fat would be pierced by Riesling’s signature component, trident-like acidity would work in contrast to the fattiness. Both items were very good on their own, but the combination was like a frenzied duel in my mouth. Taqueria La Mexicana was definitely a serviceable taco stand and the Cellar Cats would be an easy sipping wine, but they could not be partnered, they just were not destined to be together. It was an unfortunate tasting, trying to reconcile the two but in the end the burrito and wine had to be separated, leaving me desperate for a second crack at a more harmonious pairing. It will play on my mind like Santa Maria de Feira until things can be remedied. ‘Til the next edition of dining in Long Beach. My friend, I can relate to your tasting experience. As a regular consumer of Mexican food, I’ve always struggled with finding the perfect wine pairing, in particular when in comes to spicy or hot Mexican dishes. I’ve read all about pairing spicy foods with traditional fruity wines such as Rieslings, Gewürztraminer, and Zinfandel. However, there is a different element of spiciness between Asian and Mexican food. I find the fore mentioned wines do work with the flavors found in Asian food but not in Mexican. In my opinion, there is nothing similar between the spicy or hot flavors between the two. In my tasting experience I have found that “old world” style wines work the best. In old world style I mean a medium to full body dry wine such as Spanish Rioja, Jumilla or even tempranillo. I’ve also had some success with Chianti or Valpollicela and when it comes to white wines, a dry Alsace or Sauvignon Blanc. I was thinking of some old world Italian wines but remembered somebody telling me that Zinfandel pairs well with Mexican food. I love Rioja wines and I think they might be able to handle the heat from the meal. Maybe even a bottle of 2000 R. Lopez de Heredia Viña Tondonia from the Viura /Macabeo grape (white wine) or some of the same producers age-worthy red Riojas. Rey, thanks for steering me in the right direction.